A Mighty Fortress on Thursday 30 November marks the culmination of Musica Poetica’s year-long project to perform all of Franz Tunder’s extant vocal works, in the composer’s 350th anniversary year. Musica Poetica has performed 14 pieces over the course of eight lunchtime concerts ranging from short cantatas for solo voice and continuo to elaborate five-part motets accompanied by viol consort. In this, the ninth and final concert, they perform Franz Tunder’s three remaining vocal works, all richly harmonised re-imaginings of Lutheran chorales. The programme includes one of Martin Luther’s best-known hymns, Ein’ feste Burg (A Mighty Fortress is our God). A fitting end to a year in which we not only remember the 350th anniversary of Tunder’s death, but also the quincentenary of the Reformation. The story begins in the early Baroque with the creation of the chorale cantata – a fusion of Venetian concerto style and the Lutheran chorale. Composers such as Johann Schein, Samuel Scheidt and Heinrich Schütz first developed the form, creating polychoral works with instruments using Italian compositional techniques they had picked up on their travels. But Franz Tunder was to take things a stage further – the three works in this concert showcase different aspects of Tunder’s compositional style. Each one starts with the chorale melody presented by solo voice followed by a series of variations on the melody for each strophe, with the singers often deviating far from the original setting. Tunder then surrounds the voices with a magical halo of sound from the strings. Musica Poetica has been thrilled by the support they have received throughout 2017 for their Tunder World project, and the voyage of discovery into the brilliant and unexpected world of Franz Tunder. Exciting plans are afoot for 2018 – so watch this space! Before then our Welsh fans can join us on 17 December when we team up with the Swansea Bach Choir and wonderful soloists at the magnificent BRANGWYN HALL in Swansea for Handel’s Messiah. Tunder World reaches a magnificent conclusion with a performance of some of Franz Tunder’s most elaborate and influential works. In his arrangements of hymn verses is a hint of things to come in the ‘chorale cantata’ style which would reach perfection in the hands of JS Bach. The programme features three songs of praise, including Ein’ Feste Burg (A Mighty Fortress is our God), one of Martin Luther’s best-known hymns, which he wrote between 1527 and 1529. The text paraphrases psalm 46. A fitting end to a year in which we not only remember the 350th anniversary of Tunder’s death, but also the quincentenary of the Reformation. Also in this programme is Tunder’s setting of the text of Helft mir Gott’s Güte preisen (Help Me to Praise God’s Goodness). The hymn is by Paul Eber (1511-1569) and the text encourages people to remember God’s mercy and blessings, especially as the year comes to an close and New Year celebrations are planned. The poet did not refer to the Bible readings for the day but portrayed thanks for the past year and prayers for preservation in the new year. Tunder’s setting of Wend’ ab deinen Zorn, lieber Herr​ (Turn away your wrath, dear Lord) takes the hymn by Bartholomaeus Gesius (1555-1613) and sets it for 2 sopranos, alto, 2 tenors and bass with an orchestra of 6 viols and continuo. Firstly, can you tell us a bit about your musical background and training? I stumbled across early music by chance, at the age of 15, when some friends took me on a course led by the vocal group I Fagiolini. They introduced me to Monteverdi’s madrigals, which I adored (try listening to ‘Ah! dolente partita!’ from Book IV and not be converted) and so began my obsession with this repertoire. I did a Music degree at Cambridge, and when I left I became an Apprentice and then a member of the Monteverdi Choir, spending several years immersed in choral music from Bach to Brahms and touring across Europe. I subsequently trained at the Guildhall School of Music and ENO. The work I do now is a mixture of opera and early music – and sometimes both at the same time! And how long have you been involved with Musica Poetica? My first outing with Musica Poetica was for Buxtehude’s Membra Jesu Nostri at the beginning of 2016. Soprano Gwen Martin and I started the concert with his Laudate Pueri, which is scored for continuo and FIVE violas da gamba – an intensely sonorous and beautiful sound-world. I love working in a small group because each person has an important soloistic role to play, but ultimately you create something greater than the sum of its parts. Six years previously Oliver John Ruthven and I had spent a challenging but exhilarating week in France with John Eliot Gardiner, working on music from Purcell to Couperin for small ensemble. When I first sang with Musica Poetica it encompassed everything that I had loved most about that week – performing incredible music, at a really high level, with a small group of colleagues who were also close friends. And how have you found this voyage of discovery into the world of Franz Tunder this year? The 350th anniversary of Franz Tunder’s death has given Musica Poetica a great excuse to explore his vocal works, but I hope that we will continue to showcase Tunder’s music beyond 2017. Whilst it is fascinating to hear the beginnings of Buxtehude and Bach in his music, Tunder is a first-rate composer in his own right. His music is an elegant and expressive blend of early German and Italian styles, often heart-wrenchingly beautiful, and I find his text setting (which embodies the ‘musica poetica’ style) particularly poignant in his writing for solo soprano – although I am definitely biased! Can you pick out a highlight of your career to date? I have always found the opening bars of one of the earliest surviving operas, Monteverdi’s L’Orfeo, completely thrilling. So singing the small role of Ninfa for the first time in Germany was a important milestone, and more significant than grander occasions like my débuts at Carnegie Hall and Royal Albert Hall. And what’s on the musical horizon for you? Ever since my early days in The Monteverdi Choir I’ve loved singing Bach, so I’m excited to be heading to Australia next month to perform the Christmas Oratorio in Sydney Opera House and on tour with the incredible Australian Chamber Orchestra. Before then I have a couple more concerts with Musica Poetica – the penultimate Tunder World lunchtime recital, and a stunning programme including Carissimi in Approaching the Oratorio for Brighton Early Music Festival on 4 November. Hear Lucy Knight perform music by Tunder and Bach in Actus Tragicus on Thursday 26 June at 1.10pm. Early Music often suffers from a slightly staid image, yet Musica Poetica’s Baroque Tales – an evening of baroque music combined with cocktails and canapés – turns the traditional concert format on its head, presenting music from the 17th and 18th centuries in a manner more akin to a jazz club night. As performers, this presents a number of interesting questions. How should we enter the stage? Should there even be a stage? How should we address the audience? What should we wear? Should we bow? Shouldn’t we bow? Through music college and beyond, we’ve been trained to follow the rules of the concert hall, and to stick to them to the letter. But in this setting, the rules are much more fuzzy. In fact, slightly scarily (at first), there are no real rules at all. We were fortunate that Saturday’s venue was the Old Theatre Royal in Bath, with its atmospheric auditorium and conveniently-located bar (on the approach to the hall for optimum cocktail distribution). We were also able to perform in the round on the arena floor, with the audience almost able to read over our shoulders. While the instrumentalists needed to remain fairly static, singers Gwendolen Martin and Christopher Webb were able to move freely around the auditorium walking amongst the audience and spontaneously responding to the music as they were performing. One of the key aims of Baroque Tales is to remove barriers between those performing and those listening, so that the music becomes more immediate and inclusive. Consequently, the musicians talk to the audience throughout, and we’re very keen for the audience to talk to us too! During the interval, we mingled with the capacity crowd over drinks. Interestingly, a large proportion were not regular concert-goers or early music fans (yet!). Also, the demographic was more wide-ranging than at many ‘standard’ performances. Many people had been attracted by the combination of cocktails and music, and by the unusual venue, choosing Baroque Tales as ‘something different’ for a Saturday evening. The reaction was overwhelmingly positive. We were particularly delighted by the number of early music ‘first timers’ keen to find out about further concerts. When putting together the concept and programme for Baroque Tales, we were adamant that the music shouldn’t be compromised as a result of the format. Musically, the only real difference from a ‘regular’ concert is that each item is kept relatively short, with a pick ‘n’ mix selection of composers, national styles and instrumentation. The famous Rejoice greatly from Handel’s Messiah, for example, is juxtaposed with lesser-known works such as the gorgeous An Wasserflüssen Babylon by Franz Tunder – one of our favourite discoveries from our Tunder series. And the delicate French nuances of Rameau and Clérambault are contrasted with Biber’s pictorial and brash Sonata Representiva, and again with Leveridge’s bawdy Comic Songs, which wouldn’t be out of place in a modern pub! These pieces were originally written to be played in a huge variety of venues, from church to theatre to drawing room, but the one backdrop that few of the composers could have envisaged was the modern purpose-built concert hall, with its rules, regulations and conventions. Sometimes, this setting can inadvertently create an unwelcoming atmosphere, and act as a barrier to the transmission of the music that we’re so passionate about. With Baroque Tales, Musica Poetica is trying to redress the balance, and to rip up the rulebook. By all accounts, that rulebook never really existed anyway! What is the Tunder Project? The Spring edition of Early Music Today featured a fascinating interview with Music Poetica’s Oliver John Ruthven. Here are some of the edited highlights from this interview in advance the final three concerts as part of the lunchtime ‘Tunder World’ series in the heart of London. So why the focus on Franz Tunder? 2017 is the 350th anniversary of his death in 1667. His music is not widely performed, especially in the UK, and we wanted to use this anniversary as an opportunity to share his works with more people. In addition, Tunder’s music personifies the ‘musica poetica’ style after which we are named. This was a school of thought in which musical rhetorical devices were defined and linked back to those of classical literature and art. Tunder was therefore paving the way for the masters of the high Baroque, most particularly Johann Sebastian Bach. What are you performing as part of this concert series? We are performing all 17 of Tunder’s surviving vocal works ranging from miniature solo cantatas for one singer, one obbligato and basso continuo, to grander chorale cantatas for vocal consort and strings. Although these were published in 1901, a newer edition of all the vocal works doesn’t exist – so we are taking this opportunity to create a comprehensive new edition together with recordings of all of Tunder’s 17 vocal works. And what instruments and voices are needed to perform Tunder’s music? As organist and director of music at the Marienkirche in Lübeck, Tunder had a team of very capable instrumentalists at his disposal. These included violinists, viola da gambists and at least one lutenist. This was in addition to trained singers, capable of singing as a choir and as soloists. In our concert series, almost every performance involves a string consort of violins and viola da gambas, underpinned by a basso continuo team of violone, chamber organ and lute. For the larger chorale cantatas this dense string texture provides a luxurious bed of sound for the choral movements, as well as intricate interplay with single voices in his smaller solo cantatas. And from where did Tunder draw his musical influences? Tunder, like any composer of his day, was writing music to accommodate the tastes of his audience. A vogue for all things Italian may well explain the italianate-ness in much of his music. We know that as a young man Tunder travelled to Italy and may have studied with Girolamo Frescobaldi. His music certainly shows a distinctly Italian influence and there are similarities in the scoring of some of his work with the music of Monteverdi. But in terms of the texts he set, the inherent piety of his North German world, derived from its Lutheran roots, meant that the words are all taken from (and inspired by) the Bible, some in German and some in Latin. So what have we got to look forward to this Autumn? We have some real highlights to look forward to this Autumn when we will be performing Tunder’s larger scale cantatas. These clearly prefigure Bach’s own cantatas, whilst still retaining an antique quality which harks back to Schütz and Lassus. We look forward to seeing you at our forthcoming lunchtime concerts at the exquisite church of St Sepulchre’s without Newgate. https://www.musicapoetica.co.uk/wp-content/uploads/2017/08/tunder.png 517 746 Revolution Arts http://musicapoetica.co.uk/wp-content/uploads/2016/07/musica-poetica-2.png Revolution Arts2017-08-04 20:04:312017-08-06 19:08:39What is the Tunder Project? The concert features perhaps Franz Tunder’s most evocative work, O Jesu dulcissime in which two violins weave a chromatic pattern around a bass vocal soloist. This is an impassioned prayer to Christ, typical of Tunder’s chorale fantasia style. In addition to being the main organist at Lübeck’s main church, the Marienkirche, he also became the administrator and treasurer there from 1647. This cantata is paired with an extensive and virtuosic work by Nicolaus Bruhns, De profundis clamavi. Although he only lived to the age of 31 this Danish-German organist, violinist, and composer was one of the most prominent organists and composers of his generation. Bruhns’ music was heavily influenced by Tunder and his son-in-law, Dieterich Buxtehude, whose lovely keyboard Suite will also be performed. 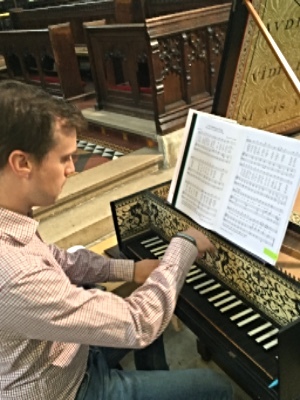 Musica Poetica’s free lunchtime concerts at St Sepulchre-without-Newgate are inspired by the work of Franz Tunder who instigated the ‘Abendmusiken’ tradition of free concerts at the Marienkirche in Lübeck from about 1646 onwards. Originally, the Abendmusiken were a series of organ recitals for the businessmen who congregated at the town’s stock exchange, but they soon grew into elaborate performances – especially at Christmas. These concerts continued through the 17th and 18th centuries and were unusual with their policy of free admission through being financed by the business community. Join us for ‘Out of the Deep’ at 1.10pm on Thursday 29 June in the tranquil setting of St Sepulchre-without-Newgate in the heart of the city of London.